The Up-To-Date Complete Map of Philadelphia and Vicinity. 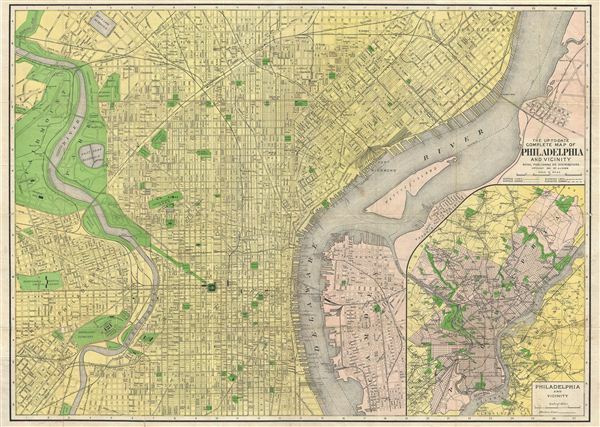 An early 20th century pocket format city plan of Philadelphia issued by Royal Publishing in 1914. The map covers central Philadelphia from Fairmont Park to the Delaware River and from Bridesburg to McKean Street as well as parts of adjacent Camden, New Jersey. Streets, rail lines, parks, bridges, and important buildings are noted. A larger map of the greater Philadelphia environs appears in the lower right quadrant. This map was drawn by A. J. Robb and published by Royal Publishing.